Our 7th graders recently completed a three-week Engineering Design Intersession (EDI). Students interviewed school staff and peers to identify design challenges around campus and then chose which problem they could work in teams to solve. 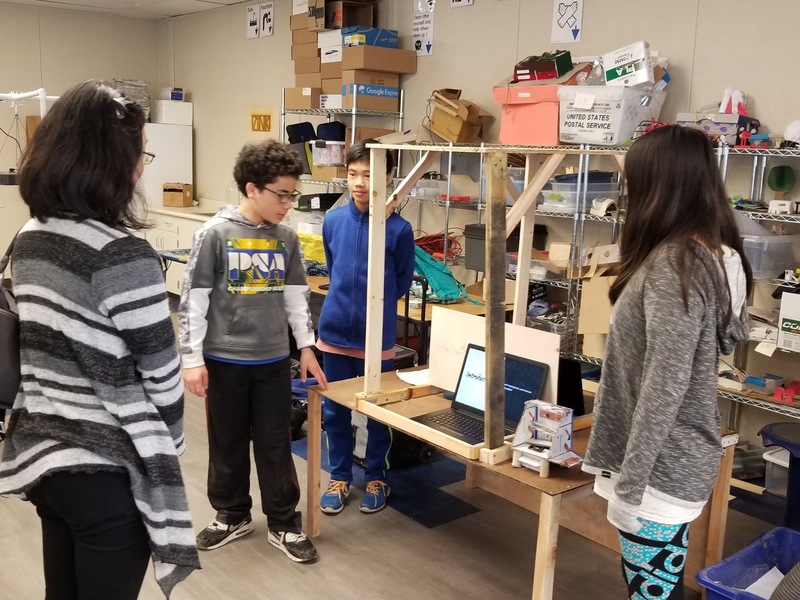 This Intersession took place in the BCS FabLab, so students had access to a variety of technology including 3D printers, laser cutters, design programs (i.e. TinkerCad) as well as power and hand tools. Please define the problem you were given and your proposed solution. (Naomi) Our given prompt for our EDI 'Future Farm' project was that Mr. Coleman needs a hydroponics table, that water can flow through, for the MakerSpace on the BCS South campus. Using the Engineering Design Process, we first interviewed Mr. Coleman to gain his perspective and needs in order for our group to make a solution that would fit to his necessities. 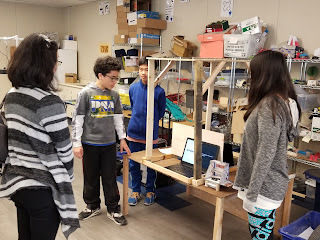 Mr. Coleman wanted to have a vertical table that he could hang lights on and one that he won't have to bend down, so our group created a prototype that suited what he wanted. Our solution was to create a taller vertical table with a frame and a top so lights could hang from them by a clip. 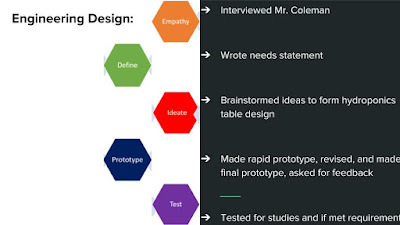 Can you describe the Ideating and Prototyping process? (Caleb) The Ideating and Prototyping process took up a lot of our EDI time. We changed our design multiple times to fit Mr. Coleman’s requirements. This step in our EDI project made us more empathetic to Mr. Coleman’s desires for the hydroponics system. This was also the step where we encountered one of our major difficulties: cooperating. One of my teammates was very uncooperative because he/she disagreed with basically everything the rest of our group wanted. Eventually, this worked out, but the other three members in our group had to do most of the planning by themselves. I think the prototyping process was very useful in getting our ideas out; however, I would have liked more time to make a more detailed rapid prototype. What did you learn during the testing phase? How did that impact your final design? All of these changes led to the final design of the 'Hydro Grow'. What were the challenges you faced in your group and as a group? How did you resolve them? (Andy) During Intersession, one of the challenges we faced, especially in the beginning, was working together effectively. We resolved this challenge by figuring out our individual skills and created roles for everybody based on their individual skills. What do you think was the most valuable thing you learned during the Engineering Design Intersession? (Andy) I think the most valuable thing I learned in EDI was how to cooperate. One of the many challenges our group had, and certainly one of the biggest, was to work well together. After over five hours together every day during the first week of EDI, it was hard to cooperate. (Naomi) I feel like the most valuable thing I learned during EDI was that ideating was a very important step in our group's process. 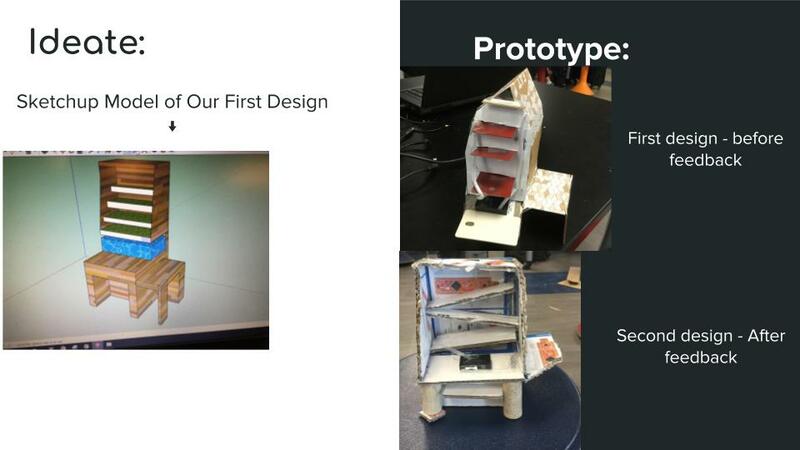 When we met a problem, such as how we couldn’t get our project through the door, we would iterate on our design until we solved the issues. The Hydroponics Team project is a wonderful example of how students at BCS are honing their 21st century skills: working through problems, using the design thinking process to collaborate, iterate, prototype, and evaluate in order to develop creative and innovative solutions.